Keto For One presents 100 single-serving, macro-proportioned keto meals for breakfast, lunch, dinners, snacks, and desserts. Single-serve cooking is one of the biggest challenges when trying to adhere to an eating plan. Most recipes are portioned for 4–6 servings, which means you’ll be eating the same thing for a week or trying to adjust recipes and struggling to figure out proper cooking times and fractions of measurements. With keto, you also have the additional challenge of balancing your macronutrients—a few too many carbs or not enough fat and your recipe is no longer in the ketogenic zone. No more fussing with recipes. No more eating leftovers. No more wasted food (or money!). No more cobbling together snacks and calling it a meal. No more temptation to give into carb-laden, nutrient-void, single-serving convenience foods. Just delicious recipes from 'low-carb queen' and best-selling author Dana Carpender. 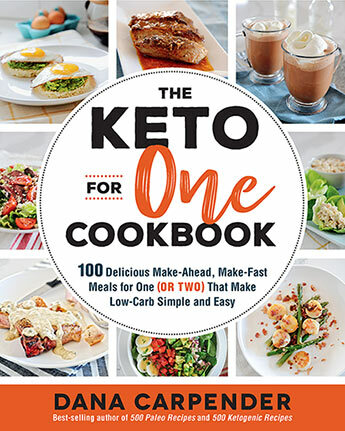 Enjoy delicious keto burgers and smoothies, as well as quick skillet stir-fries and plenty of tasty meals that can be pulled together quickly or ahead of time. Dana Carpender is a pioneer of the low-carb movement and best-selling author of over 14 cookbooks, including 500 Paleo Recipes, The Insulin Resistance Solution, 500 Ketogenic Recipes, and many more. To date, her books have sold over a million copies worldwide. She writes about low-carb cooking and nutrition on her Facebook page, Dana Carpender's Hold the Toast Press.